Revolutionize your makeup routine with Miracle Complexion Sponge by Real Techniques. The rounded side blends larger areas of the face. The precision tip covers blemishes/imperfections and the flat edge contours around the eyes and the nose, leaving you with a complexion that's smooth, enhanced and gorgeous! Use damp for a dewy glow or dry for a full coverage look. Miracle complexion sponge: Shaped to create the perfect base and build coverage where needed. 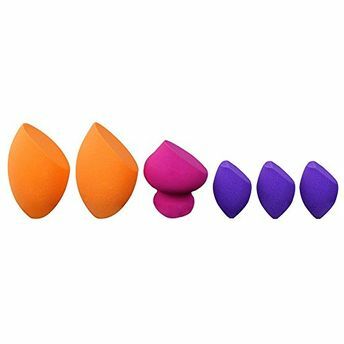 Miracle mini eraser sponges: These little miracles help sweep away your makeup mishaps with soft, flexible foam that helps pick up any type of makeupespecially around the eyes. Miracle sculpting sponge: Expertly cut for controlled application and designed to help create shadows or highlight your favourite facial features.